HP 80A toner cartridges work with: HP LaserJet Pro M401, M425. Page yield of HP 80A: up to 2,700 pages black. 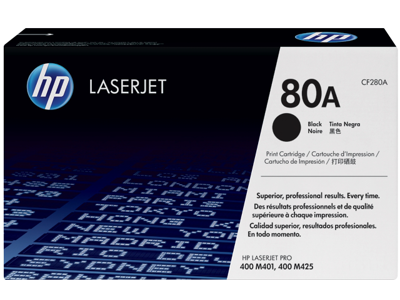 What's in the Box: New Original HP 80A (CF280A) black LaserJet toner cartridge. Produce exceptional prints thanks to the reliability and consistency of Original HP 80A toner cartridges (CF280A). Make your business look its best with sharp black text that resists smudges. For an even greater value, consider the HP 80X high yield black original toner cartridge to print more and save more. Make business documents look professional when you print with Original HP LaserJet toner cartridges. Stay productive by helping to avoid wasted time and pages. These reliable cartridges are specifically designed for your HP LaserJet printer or MFP. Count on reliable printing and professional-quality results you can be proud of. Standard cartridges designed for everyday printing. High-yield cartridges are available for frequent printing.